This pattern is available from fibertrends.com for $6.95. Children’s x-small, small, medium, large, and x-large. To fit foot legths of approximately 5” (6”, 7”, 8”, 9”). Actual size is achieved during felting so you can customize the fit for sizes between these lengths. 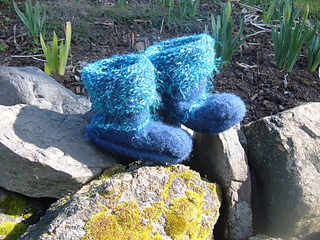 Slippers are knit with a double strand of 10 ply (worsted wt) wool. Boot in picture on pattern is shown in 10 ply Alpine 100% wool trimmed in Temptation, both from Naturally New Zealand Yarns. High top boot slippers require approx. 300 (320, 410, 470, 550) yards of main yarn per pair and 55 (60, 65, 75, 85) yards of novelty yarn. Low top boot slippers require approx. 290 (300, 380, 430, 500) yards of main yarn per pair and 50 (55, 60, 70, 80) yards of novelty yarn. Size US 13 16” circular and a spare circular needle in a smaller size.